Looking for more ideas on how to spend your days in Paris? You must download our Free 4-Day Paris Itinerary! How do you make the most of the majestic mascot of Paris without having to deal with climbing 704 stairs, waiting in line to take the lift, jostling past swarms of tourists all armed with selfie sticks and forking out a fortune for overpriced champagne in plastic flutes? Not forgetting that once you’re up the Eiffel Tower, you don’t get a view of…. you guessed it… the Eiffel Tower. So if you’re looking for the best Paris restaurants with a view of the Eiffel Tower – without having to go to the restaurant on top of the Eiffel Tower, INSIDR has you covered. Here are 6 of our top Paris restaurants with a view of the Eiffel Tower to get the best view of the iconic structure. 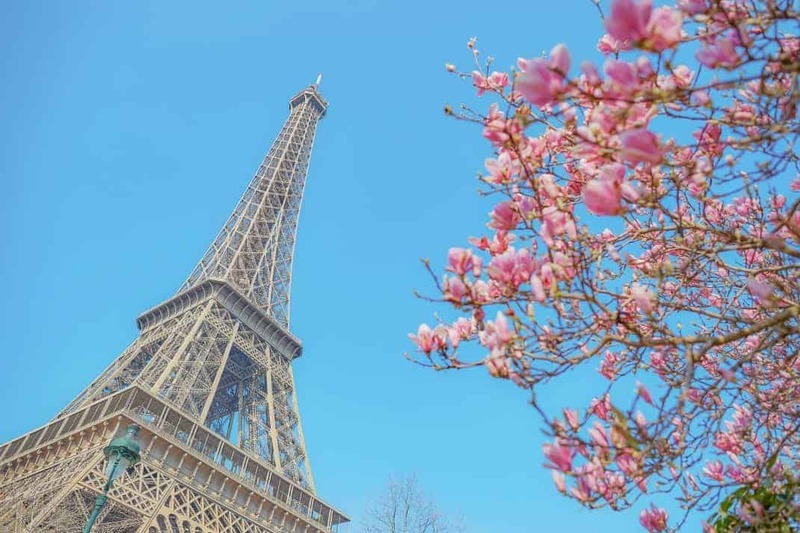 Located at the heart of the Quai Branly museum which conveniently neighbors the Eiffel Tower, Les Ombres, a rooftop terrace restaurant, is within arms reach of the magnificent monument. We recommend going in the evening so you can experience the magic of enjoying some refined French cuisine whilst being illuminated by the sparkle of the Eiffel Tower. Ideal for a romantic meal out. Pricey. Chic ambiance. Terrass-Hotel restaurant is one of the best Paris restaurants with a view of the Eiffel Tower. If you jump into the elevator of the Terrass Hotel and go to their restaurant on the top floor, when the doors open you will be welcomed by an incredible panoramic view of the city. Choose your table wisely (or mention when you book) and the Eiffel Tower is in perfect eyeshot to accompany you whilst you relish a delicious meal. Or you can walk just a few paces onto their terrace which boasts an equally spectacular view that you can enjoy with a cocktail in hand. If you want to release the inner chic Parisian within you, a dinner at la Maison Blanche will certainly do that for you. Choose a table with a front row view of the Eiffel tower, order a meal of exquisite French cuisine then sit back and enjoy. If you want to enjoy a great view of the Eiffel Tower without spending a dime, Galleries Lafayette‘s rooftop is where you should go. Just take the escalator to the 7th floor and you will be welcomed with a panoramic view of the city, with the famous monument making a star appearance. Except for the Paris restaurants with a view of the Eiffel Tower, we also found several great spots for having the best view of Eiffel Tower. Whilst from the exterior the Montparnasse tower is somewhat of an eyesore, if you take its elevator to their observation deck you will have one superb view of the Eiffel Tower. Ideal for people of all ages, very few stairs to climb, around €15 a ticket, can book in advance. Wind your way up the hill of Belleville Park and you will discover Paris really is a “belle ville”. Perch yourself on the rooftop of the Maison de l’air and you will spot a distant, but beautiful view of the Eiffel Tower. Head over there just as the sun is setting and you will get the perfect sunset backdrop to a perfect view. You can head to the restaurant Moncoeur Belleville right next door for a bite to eat afterward. Short walk to the top of the park. Free. Great for families and romantic couples.